The Topaz is the most amp-friendly model of this batch though not without measurable penalties in its specs that might translate into audible hiccups in reality. Performance wise it could well be the true entry model even though it's priced slightly above the Ruby. My task was to see how far it could be pushed and if there's a scenario under which the Topaz would be the more sensible choice over the Diamond+. One I could think of was if I had only one low-power amp at my disposal. The Topaz would be the easier load. You might think the differences in sensitivity (85dB vs. 83.5dB) and impedance (4-6 ohms vs. 3-6 ohms) marginal yet those specs honestly reflect the easier-going nature of a less aggressive woofer. The +/- 12.5mm linear excursion of the Diamond+ (almost twice that of the Topaz) proved to be a hard case for the Winsome Labs Mouse single amp. Ditto for the Elekit TU-879S and JohnBlue TL66. Not that they couldn't drive the Diamond+, they just didn't do it justice to unleash its full potential. Despite all driving the Diamond+ to sound unfailingly true to the Mark & Daniel name, I couldn't get the same degree of commitment I experienced previously. Headroom and legroom were truncated while, although not with the same low-octave supremacy as the Diamond+, the Topaz sounded fully charged and unrestrained. The two 6L6 single-ended beam-tetrode amps felt very much at home with the Topaz on a wider repertoire that included heavy orchestral works. With the Diamond+, I had to choose my repertoire with more discretion. 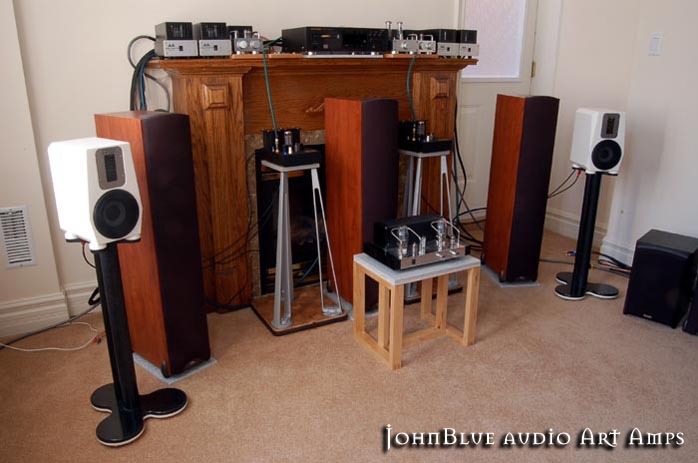 I must add however that with the 6L6 tube amps, the Diamond+ did not show alarming signs of fatigue when the Chinese drums in my ultimate test CD triggered off subsonic harmonics. Alas the Topaz bottomed out. My inquisitive nature prolonged this assignment into a marathon. Before I bore you to tears, let me cheer you up with two pieces of good news. First, an effective way to control subsonic harmonics is a pair of simple subsonic filters plugged into the input sockets of the amplifier, say the Nakamichi SF-10 I normally use for minimizing turntable rumbles. While the Diamond+ is basically immune to such distortion, the Ruby and Topaz definitely benefit the most. Second, Srajan observed very early on in his Ruby review that for Mark & Daniel's roadsters to perform their best, premium fuel is a prerequisite. The good news is, gas prices have fallen to a new historical low. 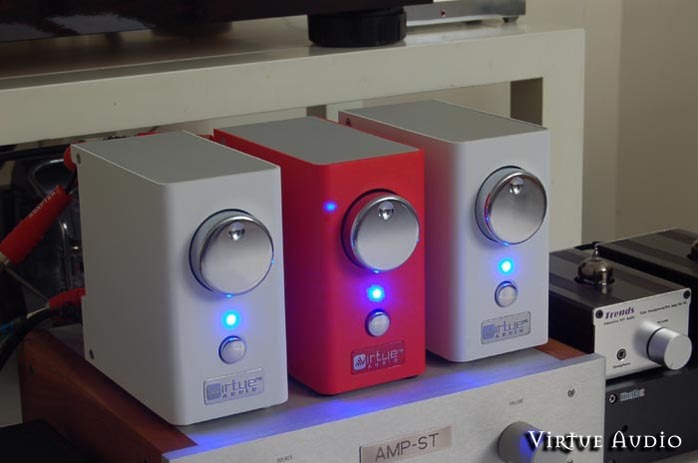 Enter Virtue Audio, another recently mushroomed Tripath amp as Srajan would put it. I received the Audiophile Two last year before the Rocky Mountain Audio Fair and have been enjoying it for driving the Mark & Daniel Maximus-Mini. (They are many chassis colors to choose from. Mine happened to be in brick red.) This setup has proven to be the best that ever presided over my daughter's desktop, period. When I was about to wrap up this project, I received the Virtue Audio Two Global Edition improved version, this time in snow white, plus the optional souped-up PSU to boost output power from 50wpc to 60wpc. Initial auditions had me excited. Wasn't this perfect for Mark & Daniel? Price no longer was a factor (Two + PSU = $500.) In no time, I had Seth Krinsky send me one more Two to gratify my bi-amp obsession. As Seth explained, bi-amping reduces the current load and the Tripath chip can deliver around 89 clean watts per channel into 4 ohms. I conducted the last round of auditions in the diagonal room again, using one Two to drive Ruby and Topaz, two Twos to drive Sapphire and Diamond+, and three Twos to drive the Maximus-Monitor plus Omni-Harmonizer. The result was simple math. Two x 2 = (to die) 4. Two x 3 = 6(moons excellence).